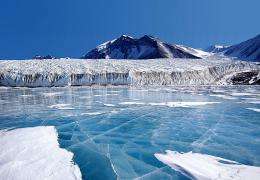 Now that West Antarctica is losing weight—that is, billions of tons of ice per year—its softer mantle rock is being nudged westward by the harder mantle beneath East Antarctica. The discovery comes from researchers led by The Ohio State University, who have recorded GPS measurements that show West Antarctic bedrock is being pushed sideways at rates up to about twelve millimeters—about half an inch—per year. This movement is important for understanding current ice loss on the continent, and predicting future ice loss. just love science when they avoid politics and stick to the facts. This is a good example of ice volume versus ice extent. Who would've ever guessed that computer models could be inaccurate?